Parliament tonight lost a historic opportunity to enact an anti-graft law when an embarrassed government was forced to beat a hasty retreat in the Rajya Sabha, lacking the numbers to push through the Lokpal and the Lokayukta Bill. 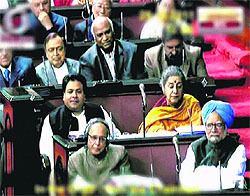 There was feverish behind-the-scene activity in the run-up to the dramatic conclusion of the Rajya Sabha debate on the Lokpal and Lokayuktas Bill today as the UPA government made desperate attempts to reach out to its allies and other supporting parties to help in the passage of the anti-graft legislation. Complying with the instructions of the Election Commission (EC), 20 police personnel, who were allegedly given out-of-turn promotions by former DGP Paramdeep Singh Gill, were transferred out of Moga district today. It is not only Guru Teg Bahadur Memorial Museum in the holy city of Sri Anandpur Sahib that is in a state of neglect, the only Anglo-Sikh War Museum at Ferozeshah, 30 km from here, also seems to have been confined to history. The iron tripod bearing plaques that announce the mute testimony to the Anglo-Sikh wars fought at Ferozeshah, Sabraon, Misriwala and Mudki has rusted beyond recognition. A GoAir aicraft parked at the airport here was on Thursday damaged after a Jet Airways bus rammed into it, forcing the airlines to cancel three flights and delayed four others. No one was hurt, the airline said. The capitulation was sad to see. A team that went Down Under with hopes of winning a series for the first time being swept away by pace and bounce was a sorry sight. Even sorrier was the feeling that this might just be the first of the losses in the series. Make no mistake, if on a pitch where the ball came on to the bat nicely and with an even bounce getting dismissed for under 300, then on pitches with a bit more in them, how will they cope?